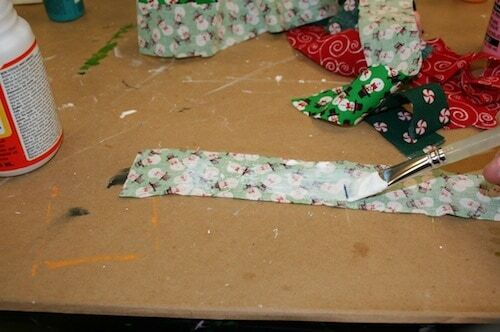 Looking for the perfect Christmas kids' craft that uses Mod Podge? Learn how to make a Christmas wreath with just a few supplies! 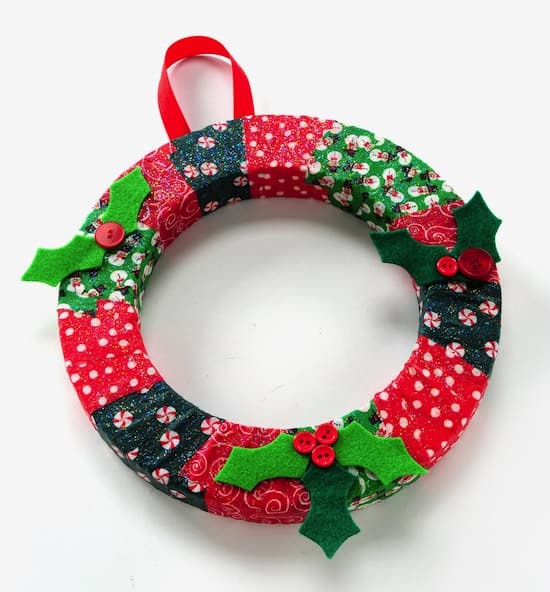 If you are wondering how to get children in on the Mod Podge holiday action, I have the perfect Christmas kids' craft for you – learn how to make a Christmas wreath the EASIEST way possible. It's really so simple and so sparkly (which kids love)! It uses a beloved formula that doesn't get quite enough attention around here: Sparkle Mod Podge. The little ones may need some assistance with the cutting and gluing, but the Mod Podging is for every level (it's kid safe!). You aren't going to believe how easy this is. 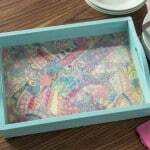 Fabrics of your choice – you can use any kind: Christmas, old scraps, etc. Cut or rip the fabric into long strips at least 12″. 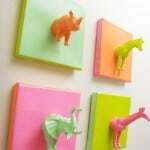 Paint the backs with a medium layer of Mod Podge. Here's a little tip. 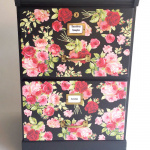 I use Gloss Mod Podge to glue things down and put Sparkle on the top. You don't have to do this; Sparkle glue things down too – but I like to preserve my Sparkle MP! Wrap the wreath with the strips. 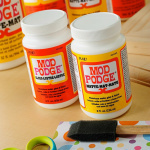 You may find out you need more Mod Podge, so add it. Especially at the beginning and ends of the strips. 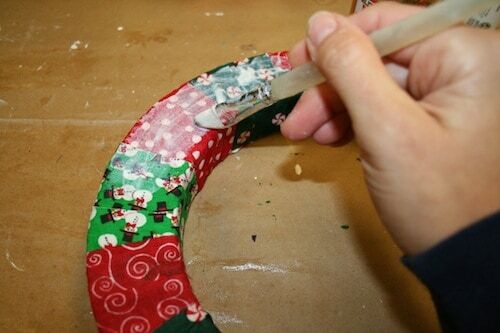 Once the strips have covered the wreath form, let them dry and add the “schparkle” on top. Let that dry. 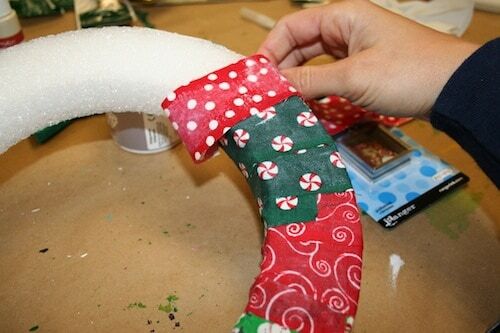 Glue embellishments like felt holly leaves and buttons – and of course, a ribbon on the back to hang. This wreath is a favorite Christmas kids' craft of mine. Now that you know how to make a Christmas wreath, you can make it with your kids for a variety of seasons! My next venture is to tackle it in winter form – blues, silvers. Your kids are going to have a blast (and you might even have a little fun yourself). 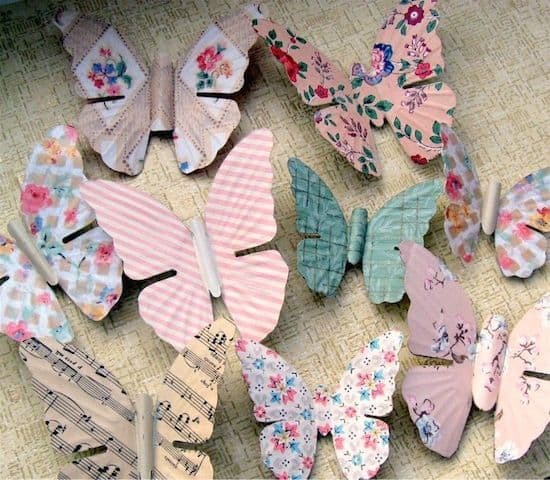 Super cute, and what a great way to use up fabric scraps. Shared this one on the StyroCrafts’ Facebook page. Thanks, Amy!